Yankee ingenuity brought prosperity and fine museums, but Springfield's claim to world fame is that basketball was invented here. Massachusetts' third-largest city has a proud history of Yankee ingenuity and calls itself "The City of Firsts." Its inventions include the internal-combustion auto, monkey wrench, ice skates, and basketball. Springfield's firsts brought prosperity which allowed Springfield's citizens to endow fine museums of art, history and science. Springfield is the metropolis of Massachusetts' Pioneer Valley, which includes the towns of Amherst, Deerfield, Northampton and South Hadley (map). The Springfield Armory, now a National Historic Site, produced weapons for American troops in the War of 1812. Union soldiers in the Civil War used the famous Springfield rifle. The armory was a virtual cornucopia of small arms, many examples of which you can still see in its museum. Elegant as these things may be, they were not Springfield's finest products. This honor is reserved for Duryea and Rolls-Royce automobiles. The Duryea brothers, Charles and Frank, built the first practical internal-combustion engine automobile (1894) on the top floor of the building at 41 Taylor St. And for a short time in the 1930s the world's most elegant auto, the Rolls-Royce, was assembled here in Springfield. Among all its inventions, only one has brought real world fame to Springfield: basketball. Yes, this is the place where, in 1891, Dr James Naismith, a physical education instructor at Springfield's YMCA College, originated the game. 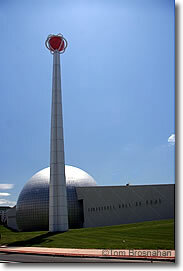 The city has a suitable memorial, the Naismith Memorial Basketball Hall of Fame, a place that's fascinating and fun even if you're not sports-minded. In the early 21st century, Springfield's economy was suffering. To give it a boost, in September 2018 the MGM Springfield Casino opened, competing with the very successful gambling casinos in southeastern Connecticut. Every September, the Eastern States Exposition ("The Big E"), New England's largest state fair, glitters and swings in nearby West Springfield. Here's more of what to see and do in Springfield MA. 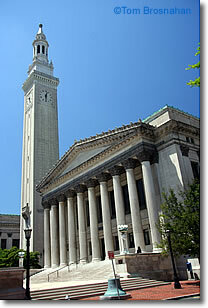 City Hall in Springfield MA.